Nothing replaces good old-school market research when you’re setting up a business. If you’re finding that, like most industries, a large percentage of potential customers are either researching your product or buying online, Google AdWords Keyword Tool can give great insight into your customer’s buying and search habits. In the Google AdWords Keyword Tool, set your region, language and for desktop and laptops in the advanced tab. Now click “exact” and “broad” in the left column and then enter the most generic term for your product. Exact match is the number of monthly searches for that exact phrase and is displayed in square brackets, broad match is the sum of all variations on that keyword – different grammatical forms, synonyms etc. 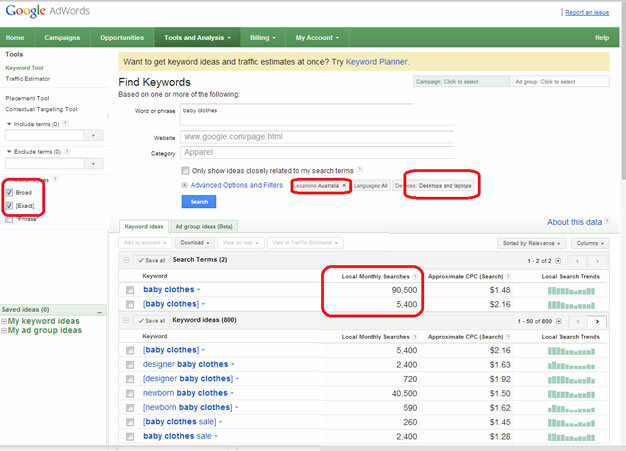 Broad match will give you some idea of demand for the whole industry – so for example, if you were searching “baby clothes”, you have a potential 5400 searches per month on that exact keyword but there are 90,500 variations overall. This tells you it’s a big industry in Australia with a lot of demand. Now go back to advanced options and choose all mobile devices. This tells you there are an additional 1000 exact matches and 27100 broad matches. This means that overall, the majority of your shoppers do so from their PC or laptop but a sizable number of searches are also done on their Galaxy or iPhone. You can also specify only mobile devices with full web browsers and mobile WAP devices (some mobile phones). This tells you that they shop when they’re out and about and that it’s worthwhile making sure your site looks great on a mobile. It also tells you that QR Codes, an App or outdoor advertising could benefit you. Note that this doesn’t mean that they’re buying while out and about, they may only be shopping. It’s vital to find out which! If you find that there is a significant number of “shopping” searches being done but not many buying ones, then you may find your industry is hard to make money from. For example, “Wedding Ideas” and variations like “unique wedding ideas” or “wedding invitation ideas” get a lot of searches but “wedding invitation designer” has only a handful. This is because some brides just love to shop. They’ll look at a thousand wedding ideas before they make a decision, so while it’s great to have that traffic coming to your site, you may find that tiny little “wedding invitation designer” gets much better results. It means that the bride has shopped and shopped and looked at all the ideas on the web and now knows what she wants and is ready to hire a designer to make it happen. Think about what you’d search at each stage in the decision making process, ask your friends, your Facebook likers or your Twitter Followers – check the difference between those initial searches and the decision to buy. If the gap is huge, it may be an industry full of shoppers, aka time wasters. As a general rule, if a keyword looks large and awesome but has a very low CPC value it’s probably got low sales conversions. Both these keywords have roughly same number of searches and may both be looking for the same thing. The difference is the first is a well informed customer who may be seeking a designer with an ability to do bespoke coding whereas the second Googler is a novice, who isn’t really sure what he needs. Who you decide to target will depend on your own skills and the products you can offer and it’s vital to create web copy in the right voice for your market. Note that online shop designer has a HUGE cost per click, so clearly they’re easier to convert! By pasting your competitor’s website into the Website search box, you can find a list of keyword ideas that you my not have considered. It doesn’t mean that your competitor is ranking for all those keywords simply that they are keywords associated with words on the site. You can then pick off any keywords that are also applicable to your business and explore them to see if there are opportunities that your competitors are pursuing that you hadn’t thought of, or if you competitors are pursuing a specific niche through their keyword optimization. Google Trends can also help you before you start and of course Analytics and Webmaster Tools can help once you’re up and running. Again, there is no replacement for good old fashioned market research but there are plenty of insights to be gained from the Google AdWords Keyword Tool. Guest Blog by Dana Flannery, SEO Copywriter at Talk About Creative a firm dedicated to more affordable SEO solutions for small to medium businesses. Dana’s focus is on finding highly accurate keyword research, helping small businesses to quickly become established and then to grow towards their goals without paying crippling SEO fees.